Malnutrition in hospitalized patients has been underdiagnosed and undertreated for decades. Now that health care professionals are armed with new strategies focused on an interdisciplinary team approach, its prevalence could decline. In 1974, the article “Skeleton in the Hospital Closet” by the late Charles E. Butterworth Jr, MD, called attention to the existence of malnutrition in our nation’s hospitals. While it’s been 40 years since this article was published, hospital malnutrition still remains a serious issue today. Many patients entering the hospital require enteral nutrition (EN) or parenteral nutrition (PN) as an intervention to either prevent or treat malnutrition. Regardless of the route chosen for nutrition support, patients are at risk of malnutrition if these therapies are withheld or inadequately administered. Because of this, patients who receive nutrition support are still considered at high risk of malnutrition, requiring RDs to improve nutrition assessments and increase the time allotted for monitoring patients. Patients may require PN if they can’t be fed through the enteral route because of a nonfunctional or inaccessible GI tract. A nonfunctional GI tract may be the result of malabsorption, a fistulae, or obstructions. The timing of PN initiation in the ICU has been well researched and has focused on the assessment of nutrition status. Patients with severe malnutrition should receive early PN after ICU admission if they can’t receive nourishment through the enteral route. Withholding early PN in severely malnourished patients leads to a high risk of mortality and higher infection rates.2 However, it’s recommended that patients wait seven days before starting PN if they don’t display characteristics of severe malnutrition.2 Providing early PN to patients who aren’t severely malnourished is associated with higher rates of mortality and complications,2 so introducing PN at the right time will result in better patient outcomes. However, despite these protocols for introducing EN and PN in malnourished patients, combatting malnutrition requires hospital personnel to work collaboratively to foster permanent change. In acute care settings, nurses often complete a nutrition screening as part of an admission assessment. Patients identified as being at a high risk of malnutrition are referred to an RD for a full nutrition assessment. The onus of patients’ nutrition care often is placed on dietitians, but many institutions lack adequate staffing to properly assess all patients. And in many hospitals, an RD’s nutrition care plan recommendations are implemented in only 42% of cases.1 But this is an issue that could change. With policy changes in the US health care system pushing for a greater focus on high-quality and affordable care, there’s an urgent need to address the ongoing issue of hospital malnutrition and ensure that medical nutrition therapy plays a critical role in patient care. To that end, five organizations have launched a new interdisciplinary partnership called the Alliance to Advance Patient Nutrition, whose mission is to improve patient outcomes through nutrition intervention in the hospital setting by providing hospitals with tools and resources for effective nutrition care practices. The five organizations are the Academy of Medical-Surgical Nurses, the Academy of Nutrition and Dietetics (the Academy), the American Society for Parenteral and Enteral Nutrition (ASPEN), the Society of Hospital Medicine, and Abbott Nutrition. Thus far, the Academy and ASPEN have developed standardized criteria for diagnosing adult malnutrition using an etiology-based definition that takes into account the relationship between malnutrition and disease.1,4 The new nomenclature used to identify malnutrition considers the etiology and severity of malnutrition. Two of the three etiologies have an inflammatory component: chronic disease-related malnutrition and acute illness/injury-related malnutrition. The third etiology, starvation-related malnutrition, doesn’t involve an inflammatory process. No single parameter defines malnutrition, so the Academy and ASPEN proposed that malnutrition be diagnosed when at least two of six characteristics are evident: insufficient energy intake, weight loss, body fat loss, muscle mass loss, fluid accumulation, and reduced grip strength. The alliance recommends that all clinicians use these characteristics to identify and document malnutrition in hospitalized patients.1 “This defined and standardized approach to diagnosing malnutrition gives us the opportunity to identify and promote interventions as quickly as possible,” says Ainsley Malone, MS, RD, CNSC, LD, president-elect of ASPEN and a nutrition support dietitian at Mount Carmel West Hospital in Columbus, Ohio. In addition to these characteristics, the alliance has developed six key principles for clinicians to follow to provide optimal nutrition care. Applying these principles will involve collaborative efforts among members of an interdisciplinary health care team, including physicians, nurses, and dietitians, with the full support of hospital administrators. “Everyone has a role in supporting nutrition interventions, not just the dietitian. Team members have a responsibility to be involved in nutrition care. We all work together as a team to improve outcomes,” Malone says. Follow-up, monitoring, and creating a nutrition care plan for discharged patients is paramount because malnutrition isn’t cured when patients leave the hospital. The nutrition care plan should be incorporated into nutrition education for patients and caregivers, and communicated to providers who follow the patient after discharge. The following four case studies demonstrate the use of the standardized criteria developed by the Academy and ASPEN for diagnosing and treating malnutrition in patients requiring EN and PN in the context of chronic illness and acute illness/injury. Angela, 53, presents with Crohn’s disease. Recently, she quit her part-time job because she had become increasingly weak and could no longer work. She has difficulty performing daily activities due to fatigue, and she’s been eating less food than usual because she experiences eight to 10 watery bowel movements daily. Despite reducing her food intake, her diarrhea persists. She has visible signs of fat loss (orbital area) and muscle loss (temples, clavicles, shoulders), and her weight has decreased gradually from 140 to 125 lbs over three months. Angela is admitted to the hospital for dehydration and severe malnutrition in the context of chronic illness. Once stabilized, she receives PN to treat malabsorption. Her physician ruled out all infectious causes of the malabsorption and determined that it was related to the Crohn’s disease. Her malabsorption also was treated with antidiarrheal agents. During the initiation of PN, caution was taken to slowly advance calories and closely monitor electrolytes and fluid balance to lower the risk of refeeding syndrome. Angela’s functional status and energy improved as she regained weight. She was prescribed a special diet consisting of three small meals and snacks high in complex carbohydrates and low in simple sugars (fewer than 10 g/serving). Angela also had to sip on a rehydration solution between meals. As she began to increase her oral intake and her diarrhea subsided, her physician weaned her from PN. David, 38, presents with Crohn’s disease but is scheduled to receive elective surgery for an ileostomy reversal. His past medical history shows that he had a vitamin B12 deficiency and an enterocutaneous fistula status postrepair one year ago. Unfortunately, after his ileostomy is reversed, his diet is advanced, and he develops vomiting and abdominal distention along with a fever of 101.8˚F. For the past eight days, David’s oral intake has been less than 75% of his estimated needs because he’s been receiving only IV fluids containing dextrose due to his inability to eat because of the obstruction. The medical team consults the nutrition support team to determine David’s nutrition status and for recommendations for initiating and managing PN. David’s nutrition status is moderate malnutrition in the context of acute illness/injury (surgery and complications leading to small-bowel obstruction). PN is initiated and advanced to goal. After two weeks of PN, David begins to tolerate clear liquids, and his nasogastric tube is removed; his diet slowly is advanced to a soft diet; nutritional supplements are added to meet energy requirements; and his PN is discontinued. He’s discharged from the hospital without any nutrition support needs for consuming a soft diet. Richard, 60, has a history of type 1 diabetes and gastroparesis. For the last six weeks, he’s complained of worsening symptoms of early satiety, abdominal distention, and nausea. His symptoms don’t improve when he begins eating small, frequent meals; decreases his fat intake; or drinks liquids apart from eating solid foods. His hemoglobin A1c has increased to 7.5%, and he’s lost 5% of his body weight in the last 30 days. He’s eating two-thirds of his normal food intake and says he’s beginning to see his ribs, an indication of mild fat loss. Richard’s physician adjusted Richard’s ongoing prokinetic medication doses, but this doesn’t improve his symptoms. His gastroenterologist recommends enteral feeding through a jejunostomy tube since Richard’s gastroparesis isn’t responding to medications. His nutritional status is moderate malnutrition in the context of chronic illness (gastroparesis). Richard still can eat and drink as tolerated, but he receives the majority of his caloric requirements through a cyclic enteral tube-feeding regimen that he infuses 16 hours per day at home. Barbara, 23, has no significant past medical history, but she presents to the emergency department after a motor vehicle accident and is diagnosed with multiple fractures, a liver laceration, and traumatic brain injury. Her family reports no changes in Barbara’s weight, dietary intake, or functional status before admission. Barbara is intubated and sedated in the ICU. Within 24 hours of admission, she receives enteral feedings through a nasoenteric tube placement. Despite placement of the feeding tube during the first week of her admission, Barbara’s enteral feedings frequently are interrupted because of necessary surgical procedures. As a result, she receives only 50% of her estimated nutritional requirements; she loses 5% of her body weight and develops moderate edema in her lower extremities. Her nutrition status is severe malnutrition in the context of acute illness/injury (traumatic brain injury and multiple fractures). After the first week of admission, Barbara’s enteral tube feedings aren’t interrupted as frequently, and she receives 75% of her estimated nutritional requirements. She’s transferred from the ICU to a brain injury rehabilitation facility. Barbara undergoes a modified barium swallow, and the speech language pathologist recommends she eats nothing by mouth. Her enteral tube feedings are infused nocturnally so she can receive other therapies during the day. Two weeks later, she undergoes another modified barium swallow to determine if a mechanical soft diet and thin liquids can be introduced. Oral nutritional supplements are provided to meet her nutritional needs. The physician weans Barbara from enteral tube feedings as her oral intake increases and is deemed adequate. The Academy and ASPEN criteria for diagnosing malnutrition should be used for all patients in the hospital setting. The standardized nomenclature and the six characteristics of malnutrition were used in the case studies presented here to describe possible situations in which nutrition support was necessary to improve nutrition status. While many nutrition professionals have recognized the negative impact malnutrition has on patients’ short- and long-term health outcomes, malnutrition has been underrecognized, underdocumented, and underdiagnosed for decades. RDs have an opportunity to not only recognize patients as malnourished on admission and design nutrition care plans to improve nutrition delivery but also to assist in preventing patients from becoming even more malnourished through the use of nutrition support when indicated. — Mandy L. Corrigan, MPH, RD, LD, CNSC, is a nutrition support dietitian and freelance writer based in St Louis. RDs have the opportunity to not only increase awareness of hospital malnutrition but also improve patient outcomes by working collaboratively with physicians and nurses on an interdisciplinary health care team to administer the best nutrition interventions. 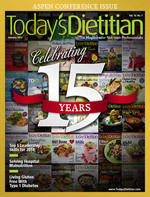 With a shared goal to address the patients’ nutritional needs and improve outcomes in a time of health care reform, dietitians can help to properly identify, document, and advocate for patients who enter the hospital with malnutrition or who develop malnutrition during their hospital stay. • Work with nursing leaders to ensure all patients undergo nutrition screening. • Keep abreast of the resources available on hospital malnutrition from the Academy of Nutrition and Dietetics (the Academy), the American Society for Parenteral and Enteral Nutrition (ASPEN), and other organizations that are part of the Alliance to Advance Patient Nutrition. • Find resources on the nutrition-focused physical examination, and incorporate the assessment of fat and muscle loss into daily practice. • Use the Academy/ASPEN etiology-based malnutrition criteria (severe or moderate malnutrition in the context of acute injury/illness, starvation, or chronic disease). • Document a minimum of two characteristics that support a diagnosis of malnutrition. Communicate what the characteristics are as well as the nutrition care plan to the interdisciplinary health care team. • Identify key stakeholders (eg, administrators, physicians, nurses) and recruit other supporters of nutrition care from other disciplines at their institution. • Know the negative effects of malnutrition (eg, increased risk of pressure ulcers, decreased wound healing, higher rates of infection, longer hospital stay, more hospital readmissions, greater health care costs) and be ready to discuss these with patients and caregivers, interdisciplinary team members, and hospital administrators. • Be a visible and vocal member of the health care team. • Ensure nutrition is an ongoing component of a patient’s health care, that it’s discussed and addressed from the time of admission and hospital stay to discharge and outpatient follow-up. • Use EMR capabilities to document malnutrition. EMRs provide standardized nutrition templates to record the etiology and severity of malnutrition, facilitate proper coding, and offer automatic triggers when nutrition screening identifies risk. 1. Tappenden KA, Quatrara B, Parkhurst ML, Malone AM, Fanjiang G, Ziegler TR. Critical role of nutrition in improving quality of care: an interdisciplinary call to action to address adult hospital malnutrition. JPEN J Parenter Enteral Nutr. 2013;37(4):482-497. 2. McClave SA, Martindale RG, Vanek WV, et al. Guidelines for the provision and assessment of nutrition support therapy in the adult critically ill patients. JPEN J Parenter Enteral Nutr. 2009;33(3):277-316. 3. 2013 Canadian clinical practice guidelines: 2.0 early vs. delayed nutrient intake. Critical Care Nutrition website. http://www.criticalcarenutrition.com/docs/cpgs2012/2.0.pdf. March 2013. Accessed October 30, 2013. 4. Jensen GL, Hsiao PY, Wheeler D. Adult nutrition assessment tutorial. JPEN J Parenter Enteral Nutr. 2012;36(3):267-274. 5. White JV, Guenter P, Jensen G, et al. Consensus statement: Academy of Nutrition and Dietetics and American Society for Parenteral and Enteral Nutrition: characteristics recommended for the identification and documentation of adult malnutrition (undernutrition). JPEN J Parenter Enteral Nutr. 2012;36(3):275-283.